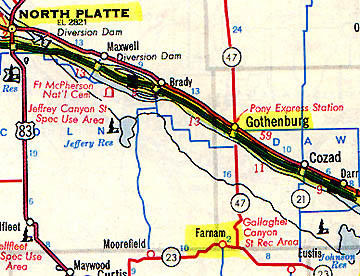 Farnam, Nebraska, southeast of North Platte, is about twenty-five minutes south of Gothenburg where the first Pony Express Station was built in the 1800s. August 28, 2004 Farnam, Nebraska – Tuesday night, August 17, 2004, something strange flew low and loud over the small farming community of Farnam, Nebraska southeast of North Platte. At least a dozen people heard the loud noise. Two days later in the early evening of Thursday, August 19th, rancher Larry Jurjens was out checking his head of about 100 cattle. Mr. Jurjens and his wife, Joanne, have lived in Farnam on the same property for thirty-five years. One of their healthiest cows, an 11-year-old black Angus, had given birth some time earlier to a calf that had grown to at least 400 pounds. 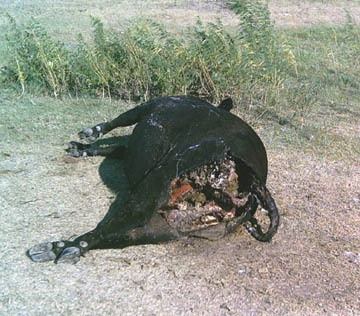 All was well on their ranch until the night of August 19, when Larry found the cow dead and mutilated. Larry Jurjens, Rancher (40 years), Farnam, Nebraska: “I come down this canyon (valley surrounded by hills) and I seen this dead cow. I got to looking further and I looked at her eyeball and her eyeball was gone. And then I looked at her bag and it was totally slashed off. I started home and started to think about her tongue and I went back and it was also severed clear back in her mouth. There wasn’t anything left of it. 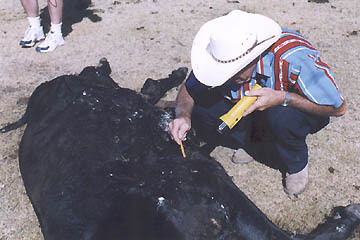 Eleven-year-old healthy cow’s left eyeball was removed, along with all the so far down in the throat that rancher Larry Jurjens could not see any remnant. Discovered dead and mutilated in the early evening of Thursday, August 19, 2004. Possible date of death was Tuesday, August 17. Photograph © 2004 by Larry Jurjens. WHAT DID THESE EXCISIONS OR CUTS LOOK LIKE TO YOUR EYE? Well, it was just a clean cut. The tongue ­ I’ve butchered a lot of cows and I know the tongue is hard to get out ­ especially with their mouth, without cutting their mouth open. I’ve never seen anything like it in my life. WAS IT CUT IN A VERTICAL CUT DEEP WITHIN THE THROAT? It was back as far as I could see. Her mouth was closed. I pried her mouth open to see if it was still there and it was gone. This was getting about dark, so it was getting hard to see. WAS THERE ANY BLOOD ANYWHERE AROUND ANY OF THESE CUTS? There was no blood whatsoever no place on this cow. I didn’t see any blood that had drained. Usually a dead cow will have blood around her and there was no blood whatsoever. Even on the back end ­ I never said that before ­ it was all open, but the buzzards had ate her. It was two days and the buzzards had ate her a little bit on the back, but no coyotes or nothing had touched her any lace else. 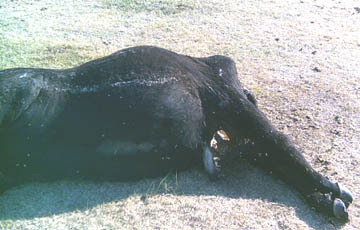 Large excision in the rectal region of cow, as found by rancher Larry of Thursday, August 19, 2004. Photograph © 2004 by Larry Jurjens. THE WHOLE UDDER WAS REMOVED WITH A CIRCULAR OR OVAL CUT? It was a round hole on her bag part. Cow’s udder removed in clean, bloodless excision. Photograph © 2004 by Larry Jurjens. DID IT PENETRATE THROUGH THE MUSCLES? OR WAS IT A CLEAN CUT DOWN THROUGH THE WHITE TISSUE THAT’S OVER THE MUSCLES? It was a clean cut on her stomach. You could see her stomach inside and was not severed at all. It was all intact. YOU COULD SEE INTO THE BODY CAVITY? Yes, when I picked her back leg up. DID YOU TURN HER OVER TO SEE IF THE OTHER EYE WAS THERE? I did two days later ­ I think it was Saturday. I went down and pulled her over. I wanted to see if there were any holes like she had been shot. The other eye was still in her head. Presuming she was laying on her left side (originally), they didn’t pick her head up to take (the left eye) out. There was two little holes right where her heart is and I never cut them open, but they were about the size of a bullet hole and they were just about an inch apart. 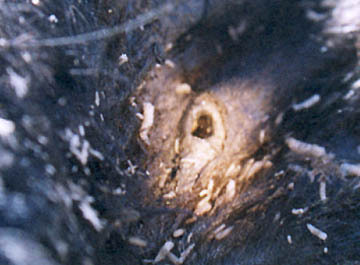 Two small holes in cow’s chest that Larry Jurjens discovered and photographed after he turned the cow over. White substances are bird droppings. Photograph © 2004 by Larry Jurjens. ABOUT A QUARTER-INCH WIDE IN DIAMETER AND ABOUT AN INCH APART. BASED ON WORK THAT I’VE DONE WITH VETERINARIAN PATHOLOGISTS IN THE PAST, THERE IS A DISTINCT POSSIBILITY THAT THE HEART WAS REMOVED, LEAVING THE PERICARDIUM INTACT. WE’VE HAD SEVERAL CASES. IT’S NOT POSSIBLE PHYSICALLY (WITHOUT EXCISION INTO THE BODY), BUT IT’S HAPPENED. SOMETIMES THESE TINY HOLES ARE IN THESE CASES WHERE THE HEART TISSUE HAS BEEN REMOVED. WE DON’T KNOW HOW THAT IS DONE. DID YOU LOOK AROUND THE GROUND TO SEE IF THERE WERE ANY UNUSUAL TRACKS, EITHER THAT NIGHT OR LATER? Yes, I did. The cows, the other cattle had milled around her and there was a lot of manure like maybe she had bellowed some and called the other cattle in. I don’t know what caused all that. I’ve never seen the cattle around a dead cow like that, the way they were around her. And there were no tire tracks there. And I couldn’t see any other tracks. It’s dry in this country and it’s hard to see tracks. DID YOU CALL THE SHERIFF’S OFFICE? My son-in-law talked to the Sheriff, but he never did call me back. THAT’S STRANGE. WHAT ABOUT A VETERINARIAN? I talked to my vet, but it was several days after and he didn’t think he could do anything. He didn’t come out and look, but I did have a friend or two who did come out and look at her at the time. DID THE VETERINARIAN TELL YOU HE HAD DEALT WITH THESE CASES BEFORE? Not my vet. He’s a young vet. He hasn’t been in practice all that long. I’m sure he’s heard of it, but no, he has not done any of these. 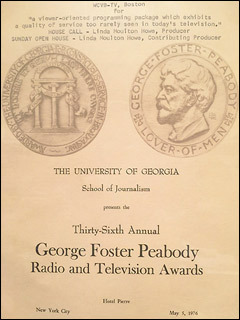 NOW, YOU THINK SHE DIED A COUPLE OF DAYS EARLIER, SO THAT WOULD HAVE PLACED IT BACK AROUND TUESDAY NIGHT, AUGUST 17. DID ANYONE HEAR OR SEE ANYTHING UNUSUAL ON THAT NIGHT? 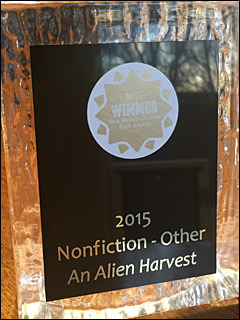 Yes, there was a loud noise the night this happened. We figured it all come in together. It was a different sound. My neighbor heard it. I’ve had people as far as 20 miles away (Karen and Dan Hudson) tell me they heard that. And 5 miles away (Brenda and Dale Oberg), they went out and looked at the sound. It didn’t sound like a helicopter and it didn’t sound like an airplane. It was a total different sound. DID YOU HEAR IT YOURSELF? 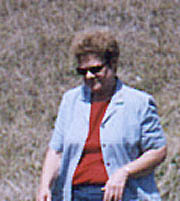 Joanne Jurjens, Farnam, Nebraska. Photograph © 2004 by Linda Moulton Howe. Joanne Jurjens: “I heard a low-flying aircraft going over the house. It was loud, slow. It wasn’t going real fast. It reminded me of a helicopter. In the noise it produced. DID THE HOUSE SHAKE IN ANY WAY? I don’t know. You know, it woke me out of a deep sleep. It scared me. It lasted maybe a minute and I was just about ready to get my husband when it went out of range. But it was a lower pitch. It was more of a rumbling sound, like a helicopter blades going around. BUT DID YOU HEAR THAT WHUP, WHUP, WHUP SOUND? Twenty miles north of Joanne and Larry Jurjens’ ranch, Dan and Karen Hudson heard the loud aerial noise at their home in Gothenburg. 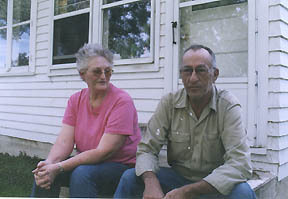 Karen and Dan Hudson, Gothenburg, Nebraska, twenty miles from the Larry and Joanne Jurjens ranch in Farnham. Photograph © 2004 by Linda Moulton Howe. Dan Hudson: “I stepped outside and all I could see was a light on the bottom of it and it was heading in a northwest direction. I saw a light and I heard a sound of a jet airplane, a large airplane, sounding like they sound when they’re coming in for a landing at big airports. AND YET ALL Y YOU COULD SEE WAS ONE SMALL, WHITE LIGHT? Karen Hudson was working at her computer. Karen Hudson: “And it sounded loud. I thought to myself, ‘The only thing that I can guess that this might sound like ­ and this is just a guess ­ would be a large aircraft coming really low. It sounded really close and it was really loud. And my cat ­ we have a cat that’s in the house ­ and she was just funny ­ like on edge, mewing and acting really strange. HOW COME YOU DIDN’T GET UP TO GO LOOK? Good question ­ I don’t know. I can’t answer that. BUT TO YOU SITTING AT THE COMPUTER, IT SOUNDED LIKE THE LOUD ROAR OF A JET COMING IN DOWN LOW OVER YOUR HOUSE? Back in Farnam at the Dale and Brenda Oberg ranch house about eight miles from the Jurjens’ home, the Obergs heard the loud sound. Dale Oberg was puzzled by how loud and long the sound persisted over their house. 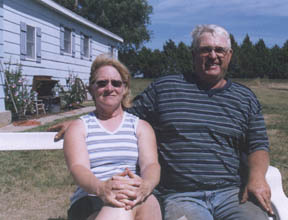 Brenda and Dale Oberg at their Farnam, Nebraska home, about eight miles from Larry and Joanne Jurjens. 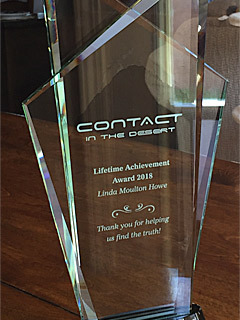 Photograph © 2004 by Linda Moulton Howe. Dale Oberg: “We was watching television in the family room. It was just a real loud roar like a plane or something and it just seemed to go on for about five minutes. And then we walked to the end of the sidewalk right by our house there and I seen a little white light going to the northwest there. And it just seemed like the noise stayed for so long and it was just like it come pretty close to over the top of our house. AND COULD YOU SEE THE LIGHT ASSOCIATED WITH THIS SOUND THE WHOLE TIME THAT YOU WERE OUTSIDE? I didn’t get up for quite a little while. Then after it continued, that’s when it continued. We looked at the end of the house and we have some pretty big trees. So we couldn’t see nothing. So, I walked a little further out west and that’s when I seen the little white light. IN TERMS OF THE SIZE OF THAT LIGHT AND THE COLOR, COULD YOU COMPARE IT TO ANYTHING I MIGHT KNOW? Well, it was just fairly white. Maybe just a little yellowish tint and it was blinking, I thought. NOT STEADY. AND WOULD YOU AGREE THAT ONE SMALL, WHITE LIGHT, EVEN IF IT WERE PULSING, IS NOT WHAT YOU WOULD ORDINARILY EXPECT TO SEE ON CIVILIAN, OR MILITARY OR COMMERCIAL AIRLINER OR CRAFT? You know, I don’t know for sure. Don’t they usually have some red lights on them? THEY USUALLY HAVE MANY LIGHTS. 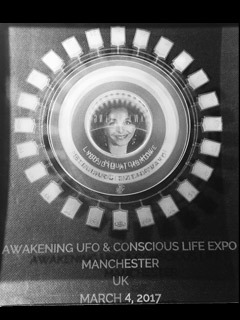 THAT’S WHAT IS SO INTERESTING ABOUT THIS YOUR REPORT AND DAN HUDSON’S ­ BOTH ARE ONE SINGLE, SMALL, WHITISH LIGHT. You know, I’ve never been around aircraft at airports or nothing, but I thought maybe it was one of those really big transport planes or something. I guess it struck me that it made so much noise. Usually, something like these military ones that go over and stuff, they go so fast that they are here and gone. But this seemed to be real slow. DID IT HAVE A LOWER RUMBLING SOUND? Just a lot of noise, a lot of noise. AND IT LASTED FOR AT LEAST SEVERAL MINUTES? At least five minutes, because I was up in one room watching television and it was just like it was over the top of our house and it just continued to make a noise. So, then we got up and walked out and looked and even when I could see the white light there, we could still hear it real loud. THE NEXT DAY, I BELIEVE IT WAS YOUR WIFE, BRENDA, – SHE WORKS WITH THE SENIORS? SHE SAID ABOUT EIGHT OF THEM WERE TALKING ABOUT HAVING HEARD THIS LOUD SOUND, TOO. Larry Jurjens: “HAVE YOU EVER HAD ANY OTHER ANIMALS MUTILATED IN YOUR 40 YEARS OF RANCHING? I’ve had the oddest things happen. I can’t say I had anything mutilated. LIKE WHAT WOULD BE ODD THINGS? 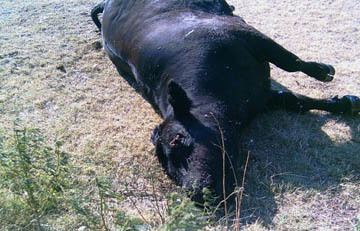 There were cases reported in England in the 1970s in which cattle either disappeared from fenced pastures, or entire herds were found in a neighbor’s pasture, inexplicably transported during the night. In the United States when the animal mutilation phenomenon occurs, often animals are reported missing in the same region. One famous and controversial case occurred in Waurika, Oklahoma in the mid-1990s. A rancher reported that 1700 of his cows and calves disappeared one weekend. The case was never solved and the insurance company finally settled with the near-bankrupt family. I traveled this week out to the Jurjens ranch in Farnam with Los Angeles producer, Jeffrey Willerth, to work on a documentary special for the History Channel about the animal mutilation phenomenon, currently scheduled for broadcast in November 2004. As we walked up to the mutilated cow on Wednesday morning, August 25, the first thing that struck me was that the animal had been laying there since at least Thursday afternoon, August 19, the day Larry Jurjens found her. Buzzards had been flying overhead and their droppings were on her body. 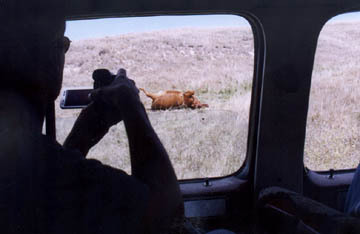 But Larry said there were lots of coyotes in the canyon and none had even approached the dead cow. 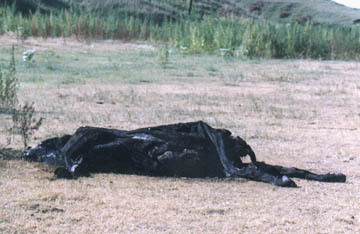 Morning of Wednesday, August 25, 2004, as we approached the mutilated by Farnam, Nebraska rancher, Larry Jurjens, on Thursday evening, August 19, 2004. 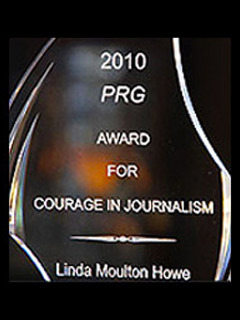 Photograph © 2004 by Linda Moulton Howe. I was especially interested in seeing the two small holes in the cow’s chest that Larry Jurjens found on August 19. I brought along a yellow pencil about one-quarter of an inch in diameter to see if it would fit in the holes. Larry was quickly able to find one of the two holes he had puzzled over and it was too small for the pencil to enter. 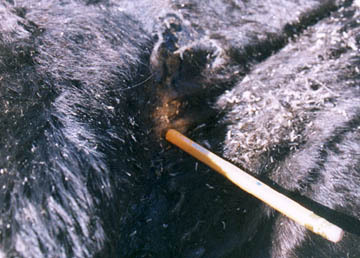 Above: Rancher Larry Jurjens tries to insert one-quarter-inch diameter pencil into hole on mutilated cow’s chest. Below: Close-up of the pencil lead stuck into the hole which was only about one-eighth inch wide. 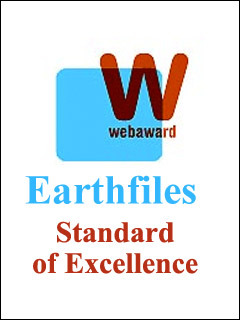 Photographs © 2004 by Linda Moulton Howe. 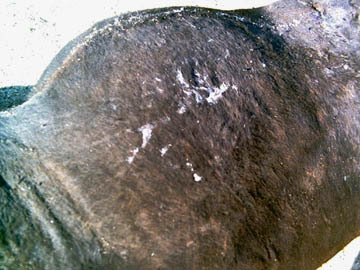 Small hole in mutilated cow’s chest surrounded by raised and lighter-colored tissue, highlighted by flashlight beam. 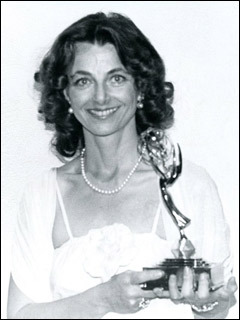 Photograph © 2004 by Linda Moulton Howe. The diameter was closer to one-eighth of an inch. There was a clearly defined raised edge encircling the hole. In past animal mutilation investigations when I’ve been able to have tissue analyzed by pathologists, those raised edges of mutilation cuts have shown evidence of high heat, hot enough to cook the hemoglobin and collagen. So, Larry Jurjens helped me cut out the one hole we could find and I put it in an alcohol/distilled water mixture for preservation and analysis. The second hole that he said was one inch from the other hole we could never find. There were a lot of worms and maggots embedded in the hide itself by then and might have filled the second hole. I also collected grass and soil samples from around the cow’s body and much further out for controls to see if biophysicist W. C. Levengood can confirm any biophysical and biochemical changes as we have in previous animal mutilation cases. While we were working at the Larry and Joanne Jurjens ranch, Larry received a call about another unusual dead cow and we took off to go see. The second ranch was a few miles away and the red-haired cow was laying on her back atop a small ridge surrounded by hills. The farmers estimated she had been dead about twenty-four hours. Her ear tag had come off uphill about twenty feet from her body. One of her teats had been removed, perhaps by buzzards. It did not have the clean, “surgical precision” I have seen so often at other animal mutilation sites. One of the cow’s eyes was gone, but the socket was full of blood. 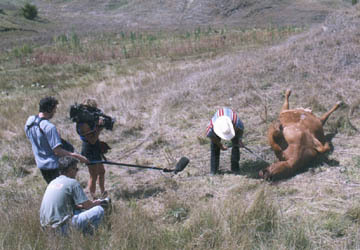 Producer Jeffrey Willerth and the second Farnam mutilated cow we investigated for History Channel documentary on Wednesday, August 25, 2004. Photograph © 2004 by Linda Moulton Howe. 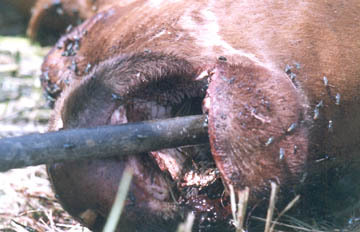 Larry Jurjens used a rod to pry open the cow’s closed mouth. The tongue had been removed from the back throat without blood in the mouth or on the ground. This particular animal remains a puzzle for me because it is not like the classic mutilations of the past several decades, but it’s unlikely that predators could have removed the tongue so deeply and cleanly from those clamped shut jaws. Above and below: Farnam, Nebraska rancher, Larry Jurjens, pries open the dead cow’s mouth to see if the tongue had been removed. It was cut out from back in the throat and there was no blood. 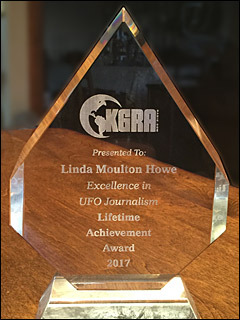 Photographs © 2004 by Linda Moulton Howe.